Can USMCA, the successor to NAFTA, get through a skeptical Congress? Can Trump rally U.S. Congress behind USMCA? President Donald Trump hailed news of a trade deal with Canada and Mexico as a major victory for U.S. factory workers. WASHINGTON — Negotiating a NAFTA rewrite was tough enough for the White House. Now comes another heavy lift: getting the pact through a conflicted Congress. President Donald Trump hailed news of a trade deal with Canada and Mexico as a major victory for U.S. factory workers and farmers — a campaign promise made and kept, he said, to rebalance economic benefits in America's favor. But lawmakers, industry and interest groups are withholding full-throated support for the deal until some details become clearer, such as how the new regional content and minimum-wage requirements for autos would be applied and enforced. According to veteran political observers and trade experts, there are multiple scenarios that could determine whether the North American Free Trade Agreement overhaul gets the congressional green light. The politics of trade have been scrambled this decade, and guessing where lawmakers stand is complicated. Trump made protectionism acceptable in a Republican Party that traditionally stood for unrestrained trade, while Democrats who long howled about free trade failing to deliver benefits to the working class may find themselves torn between labour-friendly aspects of the deal and helping a president they despise achieve a major victory. The business community's reaction has been relief more than satisfaction. The agreement maintains the duty-free trade zone on which integrated supply chains and agricultural producers depend, though it adds compliance costs. And it ends the 20 months of uncertainty that froze investment decisions. But beyond that, there's no ringing endorsement. "There isn't a single automaker that prefers the new rules to the old rules of origin," said a former U.S. trade official who asked not to be named for business reasons. "It's simply a matter of accepting there were going to be changes, and can they live with them?" To avoid tariffs, passenger vehicles will require 75 per cent content from the region, up from 62.5 per cent, and at least 40 per cent of labor must come from plants with an average wage of US$16 per hour. Each manufacturer will be affected differently, depending on its circumstances, the official said, but "The bottom line is, nobody is jumping up and down and saying, 'These are great rules of origin. This is going to restore our industry.' "
Many experts contend that the changes negotiated by the Trump administration will have marginal benefit to U.S. industry and that they are countered by a host of restrictive provisions. That lukewarm support could translate into a business community that's not motivated to lobby hard for the agreement, leaving members of Congress wondering whether to stake their fortunes on it. "It's a question of business intensity," the former government official said. "Big associations made positive general statements in support, but will constituents in each district be really pushing hard for their Congress people to get behind it?" Sen. Sherrod Brown (D-Ohio): A harsh critic of NAFTA and supporter of Trump's steel tariffs. Will the progressive Democrat side with a president he opposes on most issues? Sen. Orrin Hatch (R-Utah): Chairman of the Senate Finance Committee, which is charged with reporting trade deals to the full Senate. Hatch is a staunch advocate of free trade, but he has expressed dissatisfaction with the Trump administration's focus on tariffs. He has insisted NAFTA should be maintained as a trilateral deal. Sens. John Thune (R-S.D.) and Charles Grassley (R-Iowa) and other farm-state lawmakers: Farmers, many of whom voted for Trump, are being hurt by retaliatory tariffs from trading partners. The USMCA's small opening to the Canadian market for U.S. dairy farmers pales in comparison to lost sales in Canada and Mexico for grain, produce and meat. Labour unions: The AFL-CIO and the UAW were noncommittal, saying further review is needed to determine whether the USMCA actually protects manufacturing workers from outsourcing. Some Democratic lawmakers could follow their lead. Rep. Kevin Brady (R-Texas): Chairman of the House Ways and Means Committee, which will get the first crack at formally reviewing the deal in Congress. He is pro-NAFTA but wanted it modernized. He has been willing to give the White House the benefit of the doubt on trade policy. In the coming weeks, the three parties are expected to make technical fixes to the U.S.-Mexico-Canada Agreement, as Trump calls the new NAFTA. Trump, departing Mexican President Enrique Pena Nieto and Canadian Prime Minister Justin Trudeau are waiting until Nov. 30 to sign the agreement, per U.S. law governing fast-track congressional consent for trade deals. Republicans might be tempted to rush a review in the remaining days of the current Congress if Democrats win control of the House in the November election, according to some Washington operatives. "I can imagine a scene where Republicans try to use the lame-duck session to squeeze all this through, because I'm sure many of them don't believe the Democrats are going to give the president a win by passing his landmark agreement," said Nicole Bivens Collinson, head of the international trade and government relations practice at Sandler, Travis & Rosenberg. That would require the International Trade Commission to conduct an economic impact review at breakneck speed and other procedural time frames to be compressed. And it's possible Democrats might prefer a vote on an uncomfortable topic like trade with Mexico to take place before they would be in the majority and would get tagged with responsibility for its passage, said Kellie Meiman Hock, managing partner at McLarty Associates, the international trade consultancy. "They might find it feels easier to let the Republicans be the one to push this forward," she said. Others versed in the nuances of trade promotion authority say it is unlikely that the USMCA will be approved in the short window between the election and early January, given all the required steps. Republican leaders, especially Mitch McConnell in the Senate, have bent parliamentary norms and rules to speed votes on pet issues, such as last year's attempt to repeal the Affordable Care Act and this year's effort to confirm Judge Brett Kavanaugh to the Supreme Court. But those issues have ideologically galvanized Republicans. The political stakes aren't as high for them on a NAFTA update and may not be enough motivation to ignore rules they wrote for advice and consent on trade policy, the former U.S. trade official said. What's more, if the fast-track process is circumvented in the name of speed, the threshold for passage becomes more difficult because a challenge likely would be mounted requiring 60 votes in the Senate instead of a simple majority. For a lame-duck vote to happen, "Both houses need to be in session, and the possibility of Congress staying in session on Dec. 30 or Jan. 2 just to receive a trade agreement many legislators feel very lukewarm about, at best, is a stretch," the source added. A vote sometime in the first quarter of 2019 is more likely, according to analysts. Some opponents may try to stop the deal on procedural grounds, arguing that the administration didn't properly consult with Congress along the way, as required under fast-track authority that permits a simple up-or-down vote. Passage may depend on how labour unions react. The UAW and the AFL-CIO have long held that NAFTA was a manufacturing jobs killer as companies moved production to Mexico, but they were careful with their language after the USMCA was announced, saying the test is whether provisions to protect worker rights and the environment are enforceable. "Numerous details still need to be reviewed and resolved before making a final judgment on this agreement," the UAW said in a statement. "New protections for working families and the closing of some loopholes for global companies seeking to ship jobs overseas are a step in the right direction, but there is more work to do. We need to be assured that Mexico is going to fix weak labour laws and enforce new worker protections. We do not know what the U.S. Trade Representative and Congress will do to make sure the words in the agreement are carried out." Political experts said Democrats probably will hold out for sweeteners to improve the deal. "I think it has a chance of going through, but I think Democrats will try to extract a little more blood," Collinson said. 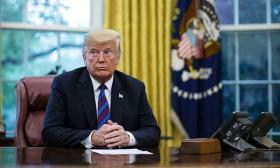 Trump still could threaten to withdraw from NAFTA if it looks like Congress might stiff him on USMCA approval, although the ex-trade official predicted he would wait until next year before considering the nuclear option. That option is not without risk, too. Some lawmakers may call the president's bluff, knowing that notice to withdraw simply starts a six-month clock on withdrawal, during which time Wall Street might react negatively and they could pass legislation blocking such a move.